Might you be thinking that maybe it’s about time you upgrade to the next level? Why do you have to miss out on enjoying the pleasure of good water pressure while camping out in your RV? 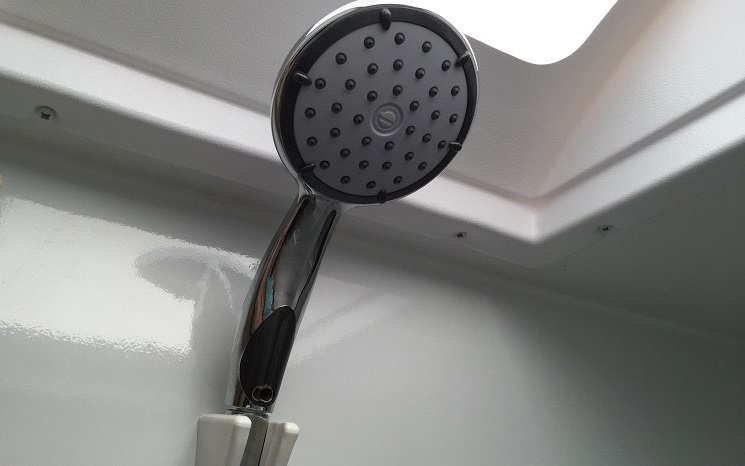 Is a new RV camper shower head on your mind? Well, you’re in luck. You’re precisely where you need to be right now. This article will briefly highlight to you a list of the top 10 best RV shower head on the market right now. Nowadays, shower heads come in many forms, even in the Recreational Vehicle realm. Stop denying yourself this simple luxury and take a quick look at this list below. 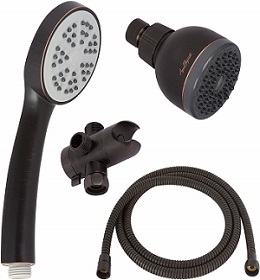 The Dura Faucet is a durable RV shower head with a 60-inch hose. It is lightweight weighing at 14.1 ounces. The Faucet is easy to install as only a hose ring and a shower mount is required. 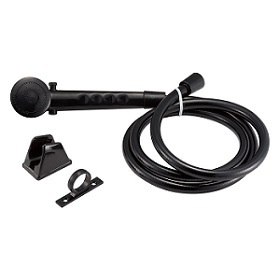 It contains an on and off valve on the head which is delivered with hardware and rubber seals. It is long lasting as its beautiful look is fade resistant. For campers, it may be a good deal for its ease in installation and its highly portable nature. This is perfect for the standard sized model Dura Faucet shower so you can shower confidently and comfortably. For a Spa-like experience, the high-pressure combo is highly recommendable. 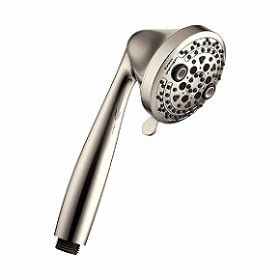 Just as its name, the high-pressure combo shower head has good high pressure. For High pressure, lovers look no further 42 self-cleanable nozzles blasts out water of the head. The shower head has a 1/2″ threaded connection. For an affordable price, a high-pressure combo is good enough to consider as the use of a paper clip can remove the flow restrictor. Just remove the black O ring placed at the bottom of your handheld showerhead using the paper clip. 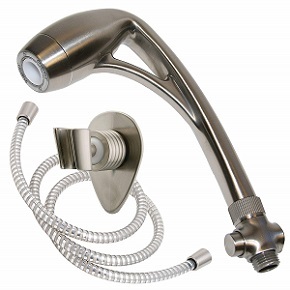 With a solid brass, the connection of the High-pressure combo is tighter compared to the use of plastic connected shower heads. The self-cleanable nozzles prevent natural calcium build-up, preventing functional problems. It is circular in shape installed by mounting on the wall. The flow of water and pressure is suitable for everyone girls, boys, women, men, and older people. This RV shower head leaves the owner in a spoilt for the choice situation when considering the spray pattern. From a choice of five spray pattern just like a drenching rain to a smooth, soft life-transforming message option. 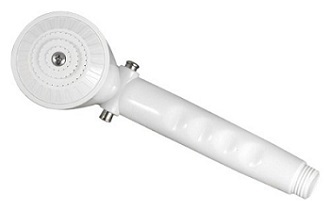 With a head of 4″ in diameter the Camco 43712 has an on/off button enabling a pause in water flow for shampooing. 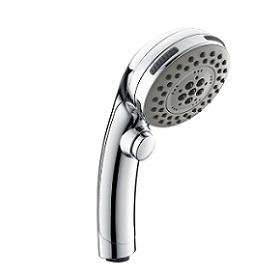 It may be difficult to shut off water flow in regular shower heads but not for the Camco RV Showerhead. It’s on and off options are on the head providing ease in the spraying of water even in washing dogs and other animals. It contains rubber spray tips which enable ease in cleaning. For smooth, gentle sprays this head is recommendable. The Camco RV 43712 model has a flow rate of 2.5 gallons per minute; the head has a switch on the inside of the handle which pushing will switch off the flow of water. It has one female and two male threads all 1/2″ in size. This head offers remarkable performance with a powerful spray shooting with the high-pressure flow. Coated mostly in ivory color, the head contains multi-functions for an adjustable bracket and alternative options such as heat levels and water pressure. The product weighs at only one pound. For installation, the head is very easily installed. In occasions a change in the shower bracket is not required as it can easily fit in different adjustable brackets, many users have fixed the head on existing brackets which holds the shower head. Flexibility in change from low pressure to high pressure is brilliant thus fast rinsing. Hot water lasts long in this RV shower head. The water stream is generous and just a little twist on the tap knob releases a fair amount of pressure. Long hair owners, I highly recommend it does the trick. Everyone would love a water saving head. This RV head has jet engine power with patented technology which adds oxygen content to your water and self-pressurized. How cool, right? It is Easy to adjust controls when using the ETL 26781 shower head from comfort to soft to stimulating. For this handheld head, water pressure is high regardless of spraying upward or downward. With a fixed spray pattern the head sprays water adequately in a circle. The head only weighs 1.4 pounds, it is 11.9 inches and the hose is 60 inches long. In the installation, no new holes for fitting the shower are required as it is easily fixed on existing holders. The shower head comes with a new wall mount that can help re-position the shower head. The white body spa can be used with a filter or a pressure regulator, no problem at all. Specially designed with Recreational Vehicle showering in mind, it employs a patented, state of the Patented Oxygenics technology that transforms weak water pressure into a luxuriously strong shower spray, giving you a truly spa-like experience. It does all this while still using much less than a traditional shower would. It comes with a SmartPause Valve that makes it highly convenient when taking those quick navy-like showers. It also happens to be quite easy to install, which means that an excellent water pressure experience in your RV can be achieved in no time. The use of the Patented Oxygenics Technology this shower head was designed with helps to widen coverage while still minimizing water usage and helps the amplification of existing water pressure as well. Water tank lifespan is extended with the help of the SmartPause Valve feature. The non-stick materials that have been used to manufacture its internal parts help prevent mineral clogging Certification as well as buildups, even when the water conditions may be especially hard. They also have a WaterSense Certification for less energy and water usage. The wand-like shower head is designed for easy access to the control of the flow control trickle valve switch and for easy gripping as well. Having that switch available ensures this type of showerhead uses much less water than a traditional shower head would use. It also has an easy installation process and the high-quality stainless steel used to make the inside of the hose makes it particularly durable. Provides excellent water pressure, enough to make you feel as though you never really left the comfort of your home. A total length of the wand as well as the shower-head measures a total of around 7.86 inches long and is an all lead-free shower kit, like with all products from the Dura Faucet organization. Its easy installation procedure means that you won’t have any need for a plumber. When it comes to RV shower head faucets, Phoenix Faucets has been a lead industrial designer in this market for no less than 35years or so. All their products are normally 100% factory tested and have brass, or DuraPro lead-free spin wielded under-bodies. They come with a customer service replacement warranty as well and are very easy to install, use and control. It also happens to be relatively cheaper than the other models on the market of its kind and is thrifty with water usage all the while offering good water pressure quality. The fourth entrant to this list of the classy shower head happens to be another product from Oxygenics, which helps establish how dominant they’ve been for the past few years. This product is actually a step up compared to the previously mentioned Oxygenics product on this list. 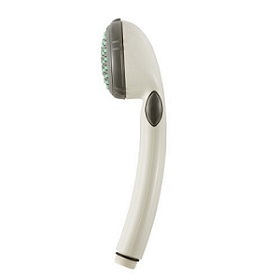 This is large because it has more adjustable settings and it offers the user a considerably wider water spray-radii. However, like all the other Oxygenics products of this nature, it uses patented technology that blends water with air to create and produce stronger shower spray without necessarily having to use a lot of water. It also has five interesting spray settings, which include; Focus Stream, Wide Stream, Oxygenics, Massage, and Focus Stream combined with Wide Stream. The non-stick coating material used to construct the inside of the hose drastically reduces the chance of the shower-kit clogging. In fact, they even offer something known as a ‘Non-Clog’ Guarantee. This product also has a WaterSense Certification which means that it uses twenty percent less water than is required by Federal Regulation, without sacrificing water pressure quality. It has 1.75 gallons per minute maximum flow rate, making it a perfect product for its affordable price. Homelody faucet products have an exciting blend of functionality, innovation, and style to them. And it’s a brand that usually has items on offer that will fit into almost anyone’s budget. This particular shower head is great for RVs and provides you with home-like water pressure. The Homelody shower kit contains a Water-saving pause feature that halts functions, which eliminates the need for you to shut off the valve when readjusting water temperature completely. This makes showering using this kit a lot easier. It also comes with five hand-held shower settings, which include; Rain Massage, Power Mist, Pulsating Massage, Power Spray and Massage. Just like the others we’ve mentioned in this list, it’s also relatively easy to install and comes with a one and a half inch connector that’s compatible with most RV showers. With RV shower heads you can shower comfortably, whether you had a hard day at work or camp. A beautiful, relaxing shower will cost you nothing. 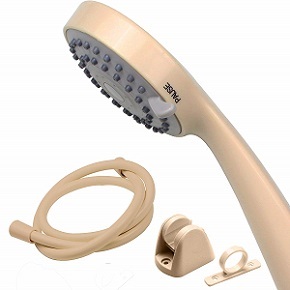 Get an RV shower head at affordable prices. Just low price for an RV shower head can change all shower dissatisfaction you may have from regular shower heads. With adjustable angles, RV shower heads can point down, different aspects for the convenience of use. As compared to other non-adjustable shower heads, the RV shower heads prove to be of high quality and have features that all customers would admire and look no further for other products. 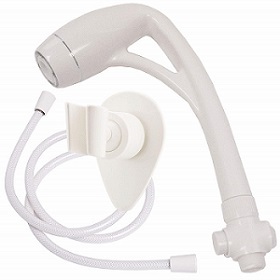 You can carry your RV shower heads to hotels, camps and other destinations for a difference shower experience. Why need refreshments? While you could always refresh with how you shower. There is nothing like a hot, morning shower, a relieving feeling that deepens one in the most relaxed thoughts of time. It is argued to be the avenue of the rich to think about rich ideas and fills the middle class with the desire to get rich someday. Just like a massage, a good morning bath can keep your day going. Well, why need a massage shower head when all you need is to change the head of your shower? A bad shower may have an awful amount of pressure and hot water may keep on switching on and off. Just to offer a few tips, here are some of the quality, performance and durability features of the best RV shower heads you can consider. Well, truth be told the comfort of RV shower heads may limit you from leaving your house for work. So be careful do not over the shower, your boss is waiting. There’s a high chance you aren’t a happy camper if your RV is still operating using its factory-installed shower-kit. Most of these cheap pieces of plastic are usually very miserable and using them will probably make you feel the same way. 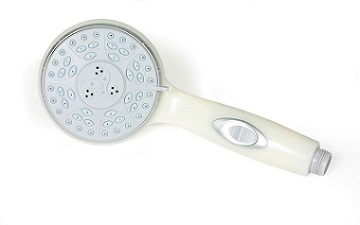 But, don’t fret, this is precisely why this best RV shower head article is here. There’s really no need for you to continue employing the use of a crappy RV shower-head. Come on now, live a little. Life is simply too short to be having bad shower experiences when you’re out camping in your RV. We’ve given you a few options, but, it’s now on you to use them. The Best Toilet Safety Rails – Top 10 Models Reviewed!